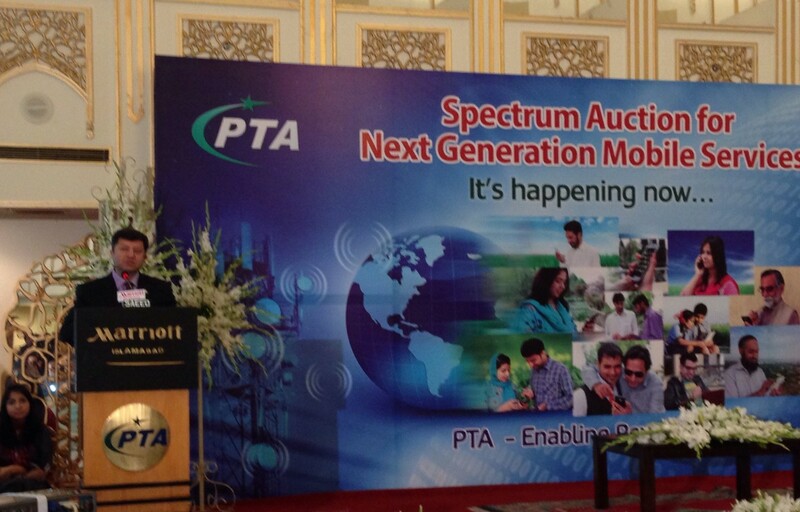 Spectrum Auctions – Merely for Making Money? It is like providing the Right of Way in the air – that is what allocation of frequency spectrum to a telecom service provider is! Just like the right of way on the ground is given for making highways or laying cables, the right of way in the air is given for electromagnetic waves carrying voice and data from one location to another (e.g. from towers to mobile phones, and back). That is why telecom sector should be rejoicing that following a Policy Directive from the Ministry of IT, the Pakistan Telecom Authority issued an “Information Memorandum” (IM) to conduct the auction for the award of spectrum to mobile broadband service providers. But are they rejoicing? At the time of the previous auction in April 2014, only 57.38 MHz was put to auction (7.38MHz in 850 band + 20 MHz in 1800 band + 30MHz in 2100 band). Out of this, only 40 MHz could be sold – thanks to the rather strange conditions of reserving 850 band for some “newcomer” (which nobody outside the government saw coming), and of allowing bids of 1800 bands only by those who first bought from the 2100 band – all that with a rather high reserve price. As I wrote in the daily Business Recorder in December 2014 (Spectrum size does matter), no amount of spectrum is enough, only if it is not too expensive. PTA’s IM declares that Government of Pakistan wishes to encourage maximum possible investment across Pakistan, to help drive improved economic and social conditions across the country. The timeline of the auction, given in IM, indicates that government aims to raise some funds before for the next fiscal year, giving credence to the perception that covering the fiscal deficit appears to be a higher priority, rather than “improved economic and social conditions”. (figures in 2x MHz) *10 MHz that is being auctioned now. As can be seen, out of the total available spectrum of 315 MHz, only 118 MHz has been released so far – merely 37%! That is not to advocate that the entire 100% spectrum should be released to the private sector forthwith. Indeed, spectrum has to be saved/reserved for various uses, like defence, the new upcoming technologies of the internet delivery (eg: Google’s project Loon does it via balloons) and 5G etc. But the fact that two-third of this precious resource is not contributing to the economy of our otherwise “poor” country, is not the best situation to be in. We also do not know when the 700 MHz band – which is supposed to be an extremely efficient band for data communication needs in rural areas – will be released for mobile broadband. As stated above, not only more spectrum needs to be released, it has also to be at prices that are affordable. Some other countries, who have already been there, learned such lessons well. The Germans, after the devastating high-price experience of 3G spectrum auctions, no longer force very high prices. In their spectrum auction last year in June, the reserve price for 2×5 MHz, in the 1800 band, was only Euro 75 Million. Compare that with our 2014 reserve price for 2×10 MHz, in the same band: US$ 210 Million. Indeed, there are still many examples of high prices in developed world, but we have to remember that wireless telecommunications are far more important for us in the developing world than in the developed world, simply because installed cable networks in developing countries cover only a very small part of our populations, and therefore our total reliance is on wireless. Growing demand for wireless broadband in Pakistan is making the telcos hungry for more spectrum. But as can be seen in government’s Policy Directive of 26th April 2016, even the previously unsold 1800 MHz is not up for sale. Strong perception is that it is because auctioning 1800 band at this stage is not expected to fetch the desired price. Apparently Government’s “desired price” is far too high in the eyes of the telcos. Therefore, government’s intention seems to be to bring the minimum amount of spectrum in the market, till the time the telcos are ready to pay that higher price. Telcos appear to be unwilling (they say: unable) to pay the desired high price – particularly in view of high taxes on telecom services, coupled with some broken promises made before the last auction (e.g. Telecom sector would be given the status of Industry), and some unpleasant surprises after the last auction (e.g. 10% advance tax on spectrum price, increased customs duties on hardware required for 3G rollouts, the same on smartphones, etc.). Certainly not the best recipe to entice some of the world’s biggest investors in the ICT space. Holding back the much-needed spectrum amounts to hoarding of the spectrum. This happens more in developing countries. Paradoxically the same governments that do not tire of advising private businesses not to hoard, start hoarding spectrum, in the hope of getting a better price at a later date. In the process, lack of spectrum degrades the quality of ICT (Information Communications Technology) networks. Never mind that ICTs, which now-a-days impact each and every segment of human life, get negatively impacted. Probably this was the reason that the authors of Telecom Act 1996 (and its amendments) legislated that the proceeds of the Spectrum Auction would go to the Universal Service Fund (USF). Once it is clear that the proceeds would not be available for fiscal balancing, the government loses most of the incentive to force-raise the bid prices. The spectrum seems to be treated as if it is a plot of land – which may be kept for the time being and sold later at a higher price, forgetting that spectrum is a resource which extinguishes with time. The economic benefit of the unused spectrum today is lost forever. A plot of land (or unused oil and gas reserves for that matter) would remain there if not used now, and contribute to the economy once put to use. On the other hand, spectrum’s economic value is in per unit of time. Additionally, utilising the spectrum today would not deplete it! As the spectrum is leased out typically for a period of 15 to 25 years, it can be “re-sold” again and again. Keeping the spectrum unsold even for one year (in the hope of getting a better price next year) amounts to colossal losses in terms of value addition to the economy. On top of that, there is no guarantee that a year later it will fetch a better price. Unsold spectrum does no one any good – not economy, not education, not health, not governance, not trade, not businesses, nothing. In fact, in today’s information world, not utilizing the available spectrum holds the country back. In some countries, studies have been carried out as to what is the unrealised economic benefit of the un-deployed spectrum to the economy per year. For instance, a study by UK-based LeCG demonstrates that the lost GDP due to a two-year 3G investment delay in China amounted to US$ 20 Bln, and in India US$ 6 Bln. Unfortunately, no such study has been carried out in Pakistan. It must be made clear that one is not advocating that spectrum auctions should not be conducted. It is the right – in fact, duty – of the government to discover the right price and allocate spectrum at the highest price that it can get from the market – for which an auction is the best option. The issue is with the employment of artificial means – like setting high reserve prices and spectrum hoarding – to “jack up” the auction prices that needs to be discouraged. It is the mere “money-making” nature of the exercise that seems to have become the only yardstick of success. Some people question, whether the apparently rich telcos deserve any sympathies. Look at the millions they spend on advertisements! The perception of telcos being rich may, or may not, be correct (their balance sheets certainly do not show them making big profits) but the fact remains that ultimately it is the users like you and me who end up paying for the service. Some of us from less privileged backgrounds do not find ICTs affordable at all. Looking at the ubiquitous nature of ICTs in today’s life, and all the benefits that ICTs bring, shouldn’t one be bending backwards to make ICTs as affordable as possible? It is easy to understand that it would be unfair to expect the government to set a reserve price lower than the one achieved in the previous auction. The media, the opposition, the courts, the investigating agencies (NAB, etc.) would not let such a thing go unchallenged. But certainly there are ways to address the issue, simply because the impetus to growth of 3G/4G is too big to be ignored. Perhaps the government could start by fulfilling some of the promises made the last time, and/or ease the payment conditions, and/or give a relief in taxation, and/or increase the spectrum lease period from 15 to 20, or even 25, years, etc. etc. But not keep the unsold spectrum hostage! Are there other options to address the issue to release additional spectrum, so that the telcos invest more in their networks, provide better, more wide-spread, and even cheaper, broadband internet services to schools, hospitals, businesses, poly-techniques, farmers, students, professionals, skilled workers, federal/provincial/local governments, software programmers, app-developers, and so many others ……? This is an excellent column. The issue of delayed access to spectrum, and to affordable mobile broadband, can best be seen in how it affects students. Although we may have some concerns about how much young people seem to be addicted to their mobile devices (when they have them), the fact is that this is the world into which they will be graduating, and familiarity and involvement with ICT devices, apps, and services will make a major difference in their ability to get ahead. If high costs and lack of access delay the chance for many thousands (millions?) of students to get involved with the digital economy, they may be permanently behind-the-curve in their opportunities. Dear Sir, I honestly appreciate your thoughts and I must thank you for sharing your thoughts that come from a very capable, positive and patriotic person. I truly hope that your thoughts reach the right people who happen to be running the show these days and I also wish blessings and help of Allah on your path. Very humbly I want to request your attention to one point and that is to link the growth of not only our industry but also of the other industries with utilization of Pakistani manpower.. I observed nationalist policies in other countries even including India but I think its the other way around here in our beloved country. If Growth of IT/Telecom Sector means stronger the status quo; situation will become better for current dominant players but there will be almost no light for unlucky jobless people. I fail to understand that how Pakistan Telecom/IT Sector continue to produce more jobs for Chinese than Pakistanis. May be some lawmaking and forcing is required to maintain a healthy yet positive competition and capitalization or dominance must be monitored and managed. I might not be very correct about my opinion as I happen to be one of the guys who was unlucky to have missed to be noticed by good books of Chinese but I noticed that I am not the only odd example but there are others who share my feelings. Thanks again and I wish you and your family always remain blessed. Hi Parvez. A thoughtful piece. I agree it is essential for governments to recognise the value of spectrum to the economy in terms of the benefits of access. The much-quoted WB figures on the impact of broadband infrastructure on GDP are worth emphasising. OTOH, when you say “It is the right – in fact, duty – of the government to discover the right price and allocate spectrum at the highest price that it can get from the market “, I cannot agree. It is the duty of the government to steward spectrum for the people. That in no way implies they should be charging money for it. Unlicensed (and soon dynamic) spectrum have proven that alternatives to a straight property-rights approach to spectrum management can be extremely successful. We need an approach that doesn’t just focus on licensed spectrum. And when it comes to licensed spectrum, it is not clear to me that spectrum auctions are the best model for emerging markets where affordability is a key element of service. Adding millions of dollars to the cost of network roll-out will negatively impact the consumer in the long run. New models such as national wholesale networks (Rwanda, Mexico) or even simple equitable assignment of spectrum across incumbents (Morocco) need to be evaluated against the cost and the difficulty of successfully auctioning spectrum. It is certainly true that the delay in making spectrum available can, in many cases, be attributed to the complexity of setting a spectrum auction that meets the needs of government while satisfying the requirements of potential bidders. Thanks for your expert comments. Your views are even more radical. Here I am grappling with opposition to my views on low reserve prices – so badly ingrained is the idea of using spectrum auctions merely to make money! Sadly, more money the spectrum auction brings, more successful it is considered. I also hope innovations like dynamic spectrum allocation will soon force governments to “mend their ways”! Very comprehensive article sir, i believe that all the telcos still haven’t utilized the 3G4G spectrum to the maximim potential due to many reasons majorly due to less handset penetration, affordability for major population etc. so currently the auction is going to br just for money making for Government. In the longer run lot has to be done but Government support will be required in return to help operators and customers reap benefits and make maximum use of technology. Thanks Ahsan. But I dont think all the telcos have not utilized the 3G 4G spectrum in Pakistan. Those telcos who bought only 5 MHz in the previous spectrum auction, now need more. It is very apparent. Yes, I agree that with lower handset prices the situation would have been brighter! This is an excellent article . I guess it has provided the answer to your earlier question about the just concluded spectrum auction in Nigeria. The issue of reserved price need to be looked at by all jurisdictions especially in developing countries. Thanks Abdullahi. From the figures I have seen, the situation of reserved prices appears to be lot better in Nigeria! I believe in Nigeria there were also other reasons at play. That’s why I asked that question. Spectrum prices might be headed lower, in many markets, as mobile operators balk at high prices, can make better use of small cell architectures and offload traffic to Wi-Fi. In some markets, ISPs will be getting access to lots of millimeter wave spectrum and also shared spectrum. More supply will lead to lower prices for licensed spectrum. You are right Gary, but more cell-sites means not just more capex, but also more Opex. In other words, higher investments. So it would not be much different than paying for more costly spectrum. The whole issue is about lowering costs, particularly in low-return developing countries! Yes, I agree that one looks optimistically at the prospects of spectrum getting cheaper due to access to more millimeter wave spectrum in the future. Thanks Parvez for raising these issues! I always like what Steve writes, and am inclined to agree with him on this. 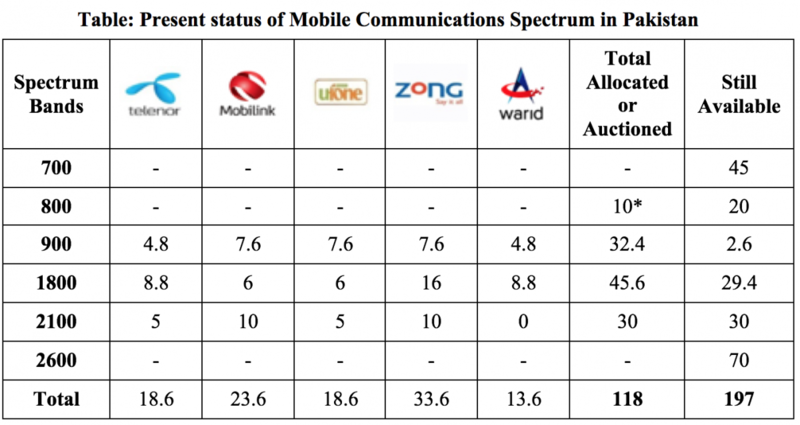 I do think we need to be creative with the use of spectrum, and it is very salient to note that much existing spectrum in Pakistan (as elsewhere in the world) is unused. I do not know the situation in Pakistan very well, but one other interesting point that I know from other countries is that there is often a real tension between the ICT/Telecoms parts of government and other, what some might call more senior, parts of government such as the Finance and Economic Ministries. In some cases, regulators really do want to release as much spectrum at relatively low prices as they can so as to boost the economy and also ensure that as many people as possible can have access, but Finance Ministers keen to balance the books tend to take a more short term approach and want as much money as possible from auctions! Am going to be writing a lot about this in my book, but need to finish the chapter I am currently writing first! I would also just add, as I know you know from your own experience, that being in government and making these decisions is very tough. I have much sympathy for my friends who are Ministers and Regulators across the Commonwealth – they have a tough job, and it is much easier to criticise than it is actually to deliver! Thanks again for contributing this thoughtful piece.